“Telemedicine is the use of medical information exchanged from one site to another via electronic communications to improve a patient’s clinical health status. 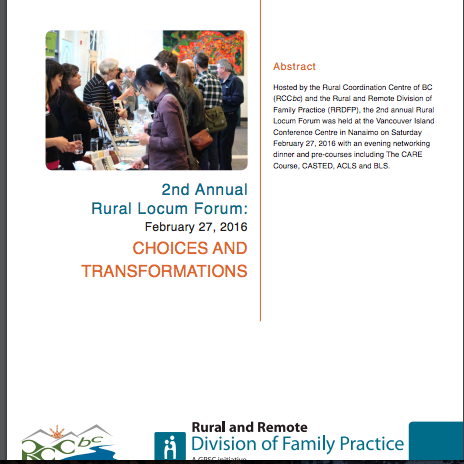 Telemedicine includes a growing variety of applications and services using two-way video, email, smart phones, wireless tools and other forms of telecommunications technology (The American Telemedicine Association)." 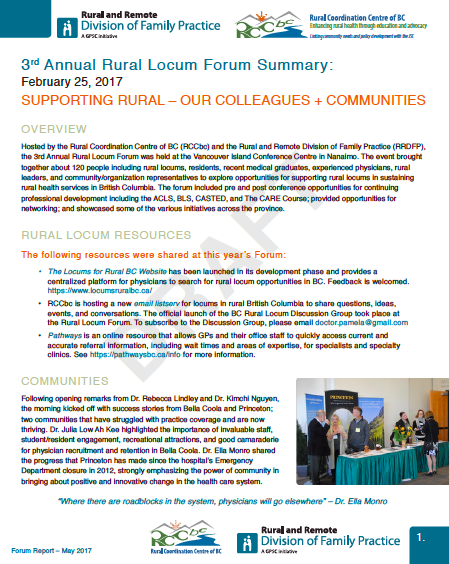 Hosted by the Rural Coordination Centre of BC (RCCbc) and the Rural and Remote Division of Family Practice (RRDFP), the 2nd annual Rural Locum Forum was held at the Vancouver Island Conference Centre in Nanaimo on Saturday, February 27, 2016 with an evening networking dinner and pre-course including The CARE Course, CASTED, ACLS and BLS.